We need ecohumanism so desperately like a glass of clean water, fresh air and a plateful of healthy food. It offers what we all want and what we strive for; lasting peace, social justice, safety and a intact planet, preserved in all its beauty and biological diversity for us and all future generations. 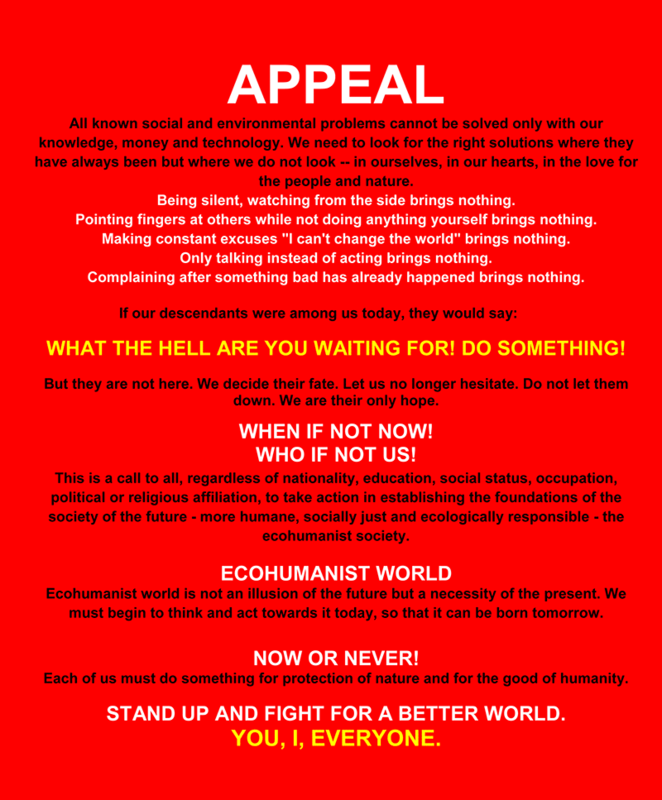 Ecohumanism is acceptable for all and can be exercised on a personal, state and global level. It is universal, long-term useful and durable. Why is for the future so important choose ecohumanism as a new social order, and not to keep the old, capitalism? Because the driving force of capitalism is egoism, of ecohumanism solidarism. Because the capitalism lives to work, ecohumanism works to live. Because capitalism is adapted to minority, ecohumanism to majority. Because capitalism splits people, ecohumanism binds it. Because capitalism glory the profit, ecohumanism people. Because the time of capitalism is dwindling, the ecohumanism time but just begins. Ecohumanist world is pleasant for the individual’s, family and society, is ecologically friendly and guarantees to the humanity: PEACE AND EXISTENCE. Why is for the future so important now build a new world, and not keep today’s longer? Because today’s world is wasteful to needs and wishes, but poor on life, against it ecohumanist moderately to needs and wishes but rich in life. Because today’s world accumulating wealth, ecohumanist on the other hand values. 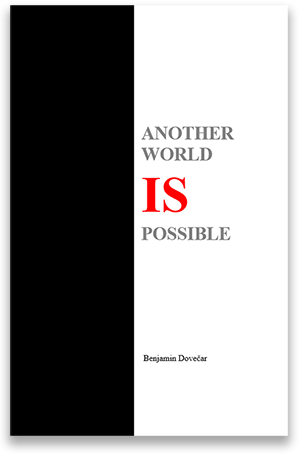 Because today’s world sow trouble, ecohumanist on the other hand success. Because today’s world is at war with nature, ecohumanist lives with her in peace.Because today’s world is a military, ecohumanist a civilian world. Because today’s world lives from the planet, but ecohumanist with him.